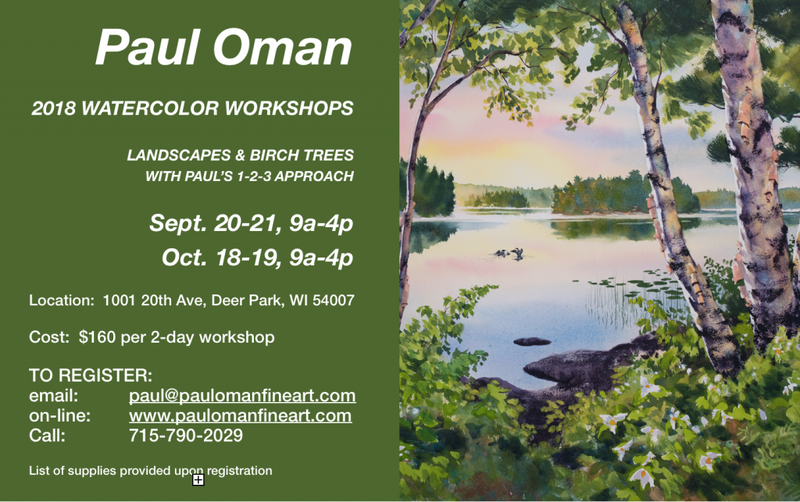 Learn, be challenged, and have fun digging into the hows and whys of painting at one of Paul's workshops. Held at the Hilton Garden Hotel and Conference Center, Paul will be the painter and presenter on the topic of spiritualty and chronic illness, and addressing approaches to facilitating spiritual development for those living with diabetes. Paul brings family of origin history and experience, along with his years as a pastor, to this discussion and presentation. Paul's presentation will be from 11 am - 12 noon. To register for this event, see Event Organizer link provided. Earth Arts Spring tour. OPEN HOUSE at our home studio/gallery, with many new originals and prints. Come and see Paul's new work in oils and acrylics, as well as his watercolors. Enjoy refreshments and fun conversation! Hope to see you here. Join us as part of the 2018 Earth Arts Spring tour. OPEN HOUSE at our home studio/gallery, with many new originals and prints. 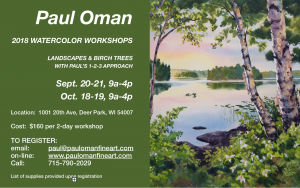 Come and see Paul's new work in oils and acrylics, as well as his watercolors. Enjoy refreshments and fun conversation! Hope to see you here. Come and browse our Gallery for new paintings and gift ideas! Refreshments and good conversation. Almost an annual tradition now. :) Hope to see you here. Support Westfields while learning about news making developments. Wineology 101 Join us Thursday, February 7th for an exciting event in support of youth mental health and well-being at Westfields Hospital & Clinic. The evening will consist of a 5 pm social hour & silent auction, and a 6 pm five-course meal with wine & non-alcoholic pairings. Paul will be leading painting instructional sessions with students this morning!